Chiropractic care is proven as an effective method of affecting the health and function of your nervous system without invasive procedures or medication. This holistic approach to whole-body health focuses on the correct alignment of the spine to allow the nervous system to function at an optimal level, which in turn encourages the body’s natural healing abilities. Through proper spinal adjustment, chiropractic care allows the body the ability to function at its full potential. This allows every member of your family to live at an optimal level of health. This form of care is safe, effective and efficient for patients of any age, whether an infant or senior. Regular chiropractic care is an effective form of preventative healthcare, which can reduce the need for medication, alleviate pain, reduce or eliminate ailments, and even increase energy! Dr. Kurt Lang and the team at Vibrant Life Chiropractic want to see you and your entire family live vibrantly! At Vibrant Life Chiropractic, we want to see your entire family live a full and vibrant healthy life in Grand Rapids, MI. As children age, pediatric chiropractic care can help to establish a firm foundation for continued nervous system function and overall health. This encourages optimal growth and development as well as an improved quality of life. We undergo stress on our spine at all stages of life, and children engage in heavy play, athletics and physical activity that can easily create spinal misalignments. With regular chiropractic care, like that offered by Dr. Kurt Lang at Vibrant Life Chiropractic, children are able to maintain ideal spinal alignment regardless of their level of activity. This allows them to maintain optimal nervous system health and can improve sleep, behavior and physical, emotional and mental development. Chiropractic is completely safe and quite effective for maintaining peak health in children. As we age our body is less able to cope with the years of stress. Like a car over time, normal wear and tear causes the body to break down. Typically, this breakdown happens slowly over a long period of time. The cartilage between vertebrae breaks down in a degenerative process, especially if the spine has been misaligned for a long time, and nervous system dysfunction can result. Regular chiropractic care for the elderly can mitigate some of these problems and lead to a longer and healthier life. Neurologically-based chiropractic care for the elderly can improve mobility, strength and coordination, allowing seniors to maintain a sense of healthy independence for years. 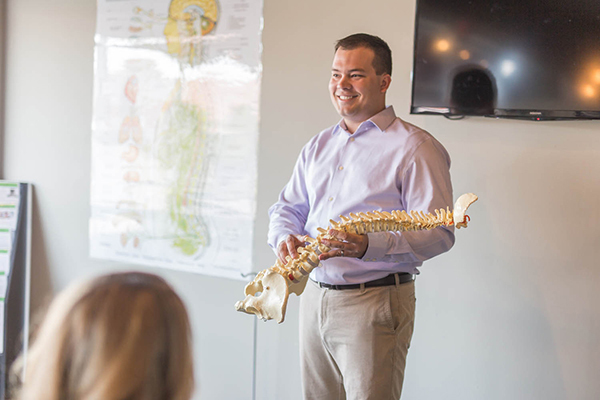 Senior chiropractic care is designed to focus on longevity and increasing energy through spinal alignment corrections to allow the nervous system to function at peak performance and the body to heal itself better in turn. Through regular care, seniors in the Grand Rapids area can reduce their dependence on prescription medication, increase their energy and lessen the occurrence of health problems. Dr. Kurt Lang has one mission: to provide ideal, preventative healthcare to patients of all ages in Grand Rapids, MI. If you’re looking for a Grand Rapids chiropractor, call to schedule your appointment today!